Gov. Ron DeSantis Monday filled the second of three vacancies on the Florida Supreme Court with the appointment of "one of North Miami Beach's own," appellate Judge Robert J. Luck. Luck joins Barbara Lagoa as the second 3rd District Court of Appeal judge DeSantis has appointed to the state’s highest court since assuming office last week and the first Jewish justice to sit on the state’s Supreme Court in more than 20 years. "Everybody loves him," DeSantis said in making the announcement at Scheck Hillel Community School, a prominent Jewish school in Miami. "He writes so well. He was born to be a judge. There’s just no doubt about it." 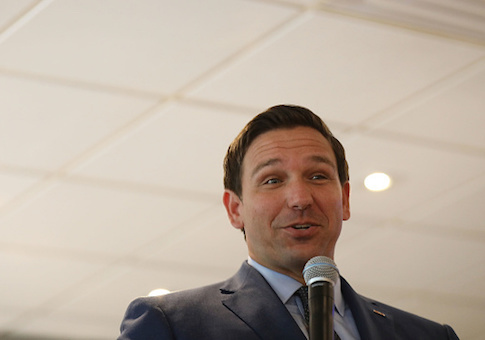 While reviewing the 11 candidates for the three vacancies, DeSantis said he was repeatedly advised, "‘You have to pick Luck.’"
Luck, who turns 40 in March, could serve on the bench through 2054. He thanked DeSantis for being one of the most "pro-Israel" politicians in the country. "I have taken an oath to make the Constitution, and not the judiciary, supreme," he said, noting he hopes to serve on the high court, "God willing for the next 35 years." Luck was appointed to the 11th Judicial Circuit Court in June 2013 by Gov. Rick Scott. In 2017, Scott appointed him to the Florida 3rd District Court of Appeal. Before being appointed to the bench, Luck served as an assistant U.S. attorney for five years in the Southern District of Florida, handling appeals, major crimes and economic crimes. The son of a truck salesman and a teacher, Luck is a graduate of the University of Florida law school. He worked as a Congressional legislative correspondent for former U.S. Sens. Senators Paul Coverdell, R-Georgia, and Jon Kyl, R-Arizona, served as the editor-in-chief of the Florida Law Review, and clerked for Judge Edward E. Carnes on the U.S. Court of Appeals for the 11th Circuit. Luck and fellow Miami native Lagoa, 52, fill two of the three seats on the Supreme Court vacated on Jan. 8 with the retirements of Barbara Pariente, R. Fred Lewis and Peggy Quince. Ironically, on July 1, the 70-year-old mandatory retirement age becomes 75 following approval by Florida voters in November of a constitutional amendment raising the retirement age for judges. DeSantis has not indicated when he will appoint a justice to fill the third vacancy on the bench, but in replacing liberal justices Pariente, Lewis and Quince, who thwarted the GOP-dominated Legislature and successive Republican governors through the years, he has an opportunity to turn the table for years, if not decades. Luck, Lagoa and the third appointee will turn the court’s conservative majority into a conservative bloc, joining conservatives Chief Justice Charles Canady and justices Alan Lawson and Ricky Polston on the bench. Lagoa, the high court’s first Cuban-American female justice, is a veteran jurist who has authored more than 300 majority opinions since her appointment to the 3rd District Court of Appeal by Gov. Jeb Bush. By comparison, Luck does not have as an extensive résumé because of his youth and relatively short time on the bench. But he does have a disturbing distinction among the state’s justices – Luck was attacked in open court in February 2015 by a criminal defendant and suffered a scratched neck and head lacerations. He declined medical attention and returned to the bench the next day. This entry was posted in Issues and tagged Ron DeSantis. Bookmark the permalink.